Who are the biggest employers in the District? The District’s FY 2014 Comprehensive Annual Financial Report is now out, and it is filled with lots of interesting information. 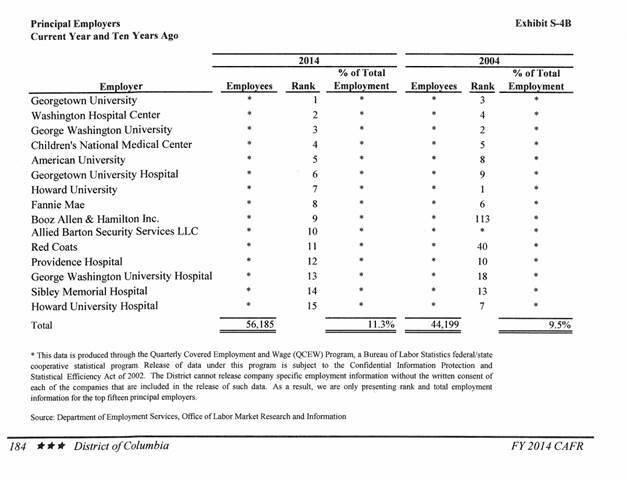 Here is one bit: The top fifteen private employers in the District account for 11.3 percent of the employment. You see on the top of the list hospitals and universities–the same employers we saw in similar positions ten years ago. However, two entities in today’s top ten were nowhere near the top back in 2004. Booz Allen & Hamilton, Inc., which occupies the ninth place on the list, was ranked 113th in 2004. Allied Barton Security Services, LLC, which is in the tenth place, was not even ranked back then. < Previous How $200k Can Seem Middle-Income in D.C.